I miss platformers. A once stalwart gaming tradition, probably even the gaming standard, has been reduced to some tiny, arthouse indie games you can find on steam for $5. I often find myself returning to Isle Delfino in Super Mario Sunshine, because I miss that feeling of adventure, discovery and child-like wonderment that, at least to me, has not been replicated since Sunshine came out almost 15 years ago. However, I think I feel a change coming to the world of games. There's a certain level of discontent present in the community, which seems to feel like it has become stagnant. I think that's why Battlefield 1 both was developed and was so successful. Is it totally new? Absolutely not, but is it a breath of fresh air in a video game climate of sameness and yearly installments? It absolutely is. 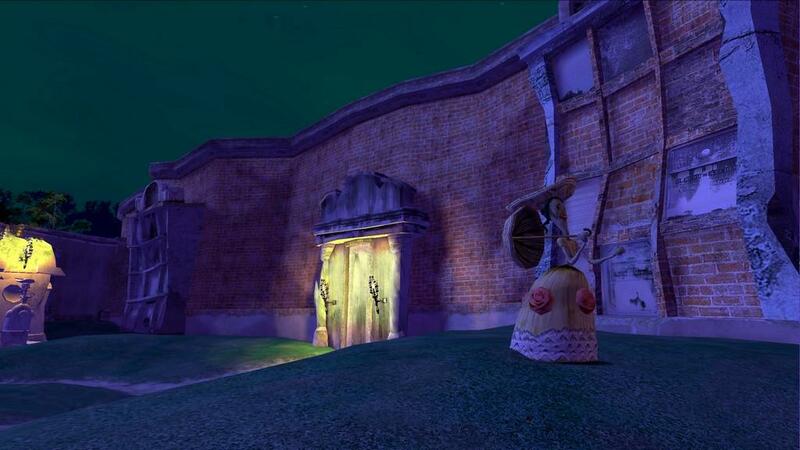 Enter Voodoo Vince: Remastered. Even when it came out in 2003, it arrived at the tail end of an era, and you can tell just by playing it. Voodoo Vince is incredibly self-aware, and the eponymous character is painfully aware of the fact that he is in a video game, constantly breaking the fourth wall and making jokes about video game tropes. It makes for a very interesting experience; it's been so long that most of the game's content feels fresh, though Vince is quick to remind us that, once upon a time, these were the games that everyone was getting tired of. 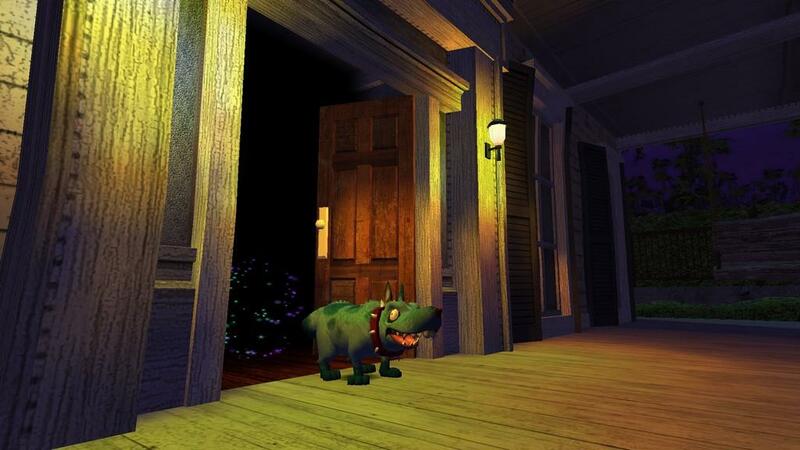 The story of Voodoo Vince kicks off when the villain kidnaps Vince's creator, voodoo shop owner Madam Charmaine, in order to acquire powerful Zombie Dust, which has the power to animate inanimate objects. Of course, a little bit of this dust spilled onto Vince, bringing him to life and setting him upon a quest through a voodoo-inspired re-imagining of New Orleans to save his master. The game world is so much fun. I was worried, towards the beginning, that the voodoo theme would start to wear thin as the game went on, but it never did. The pacing is just so that you're in each area for exactly as long as you should be, with just the right amount of exploration, before moving on to something new and exciting. It has a respectable length, as well; it's not super long, but, as I said, it's just as long as it needs to be. The gameplay is pretty by the numbers, but for the most part it's perfectly enjoyable. Platforming feels very fun, with Vince having a nice hover ability that lets you guide your descents more accurately. The meat of the gameplay is in the puzzles, some of which are a genuine challenge to figure out. 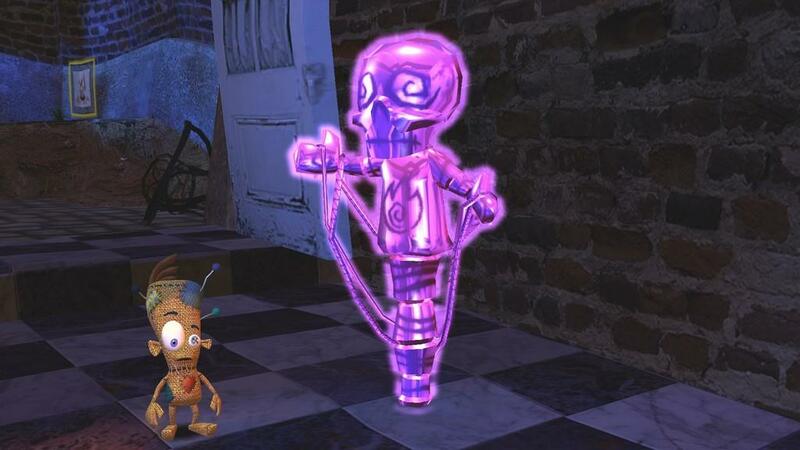 They force you to use the game's unique premise, Vince's voodoo doll body, to solve them. 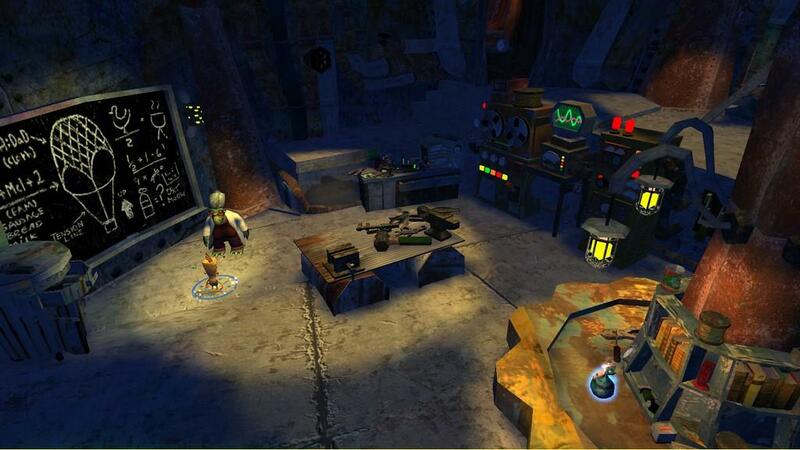 For example, early on in the game, you have to send Vince through an industrial grade blender to solve a puzzle. Ordinarily, this would be an obvious and instant death for your character, but because Vince is a voodoo doll, any harm inflicted onto him is actually inflicted upon his targets. Unfortunately, this doesn't really carry over into the combat. First of all, the very fact that enemies can hurt Vince seems to be a bit of a paradox, but I suppose it was necessary for there to be a game. Second of all, the combat just isn't very fun. Vince can punch, do a spin attack, and do a version of a ground pound, and that's as far as his arsenal extends. I often found myself just avoiding combat whenever I could, because it didn't impact the game at all and allowed me to get to the fun puzzles and see more of the wonderful world sooner. He does have some really flashy voodoo moves, where you use points collected from defeated enemies to perform a sort of finishing move that clears enemies out of a large area. These animations are always really fun, with Vince getting annihilated in various over-the-top fashions, thereby annihilating his enemies, but they aren't very useful and I didn't ever use them for any reason other than that I could. Another staple of platforming is collecting the items scattered around the various levels. 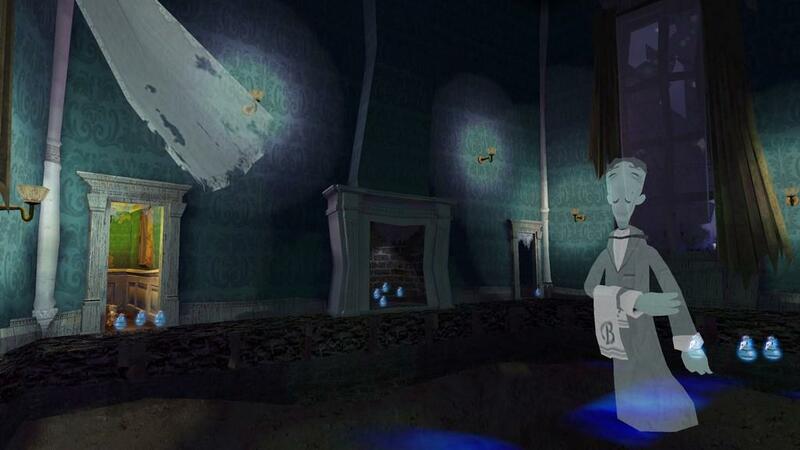 This features prominently in Voodoo Vince, which has three different types of items for you to collect. The first are bottles of dust, every 100 of which will increase Vince's health. Secondly, you can find items that will unlock more finishing moves for Vince to use. 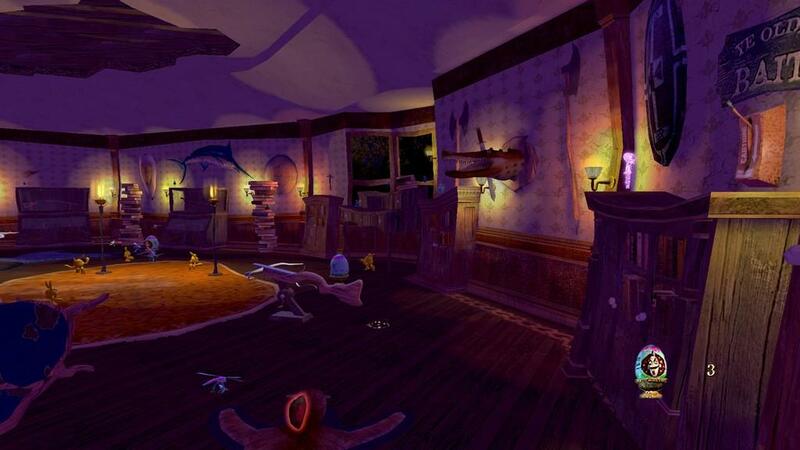 Thirdly, you can collect little scraps of paper, which make a giant purple skull appear on the map. Once the skull appears, you have to chase it around the map in a sort of platforming race and collect it at the end, which increases the amount of energy Vince can store for his finishing moves. The heart and soul of Voodoo Vince is its wonderful personality and sense of humor. The world is so weird and fun to explore, Vince with his fourth-wall-breaking annoyance is always hilarious, and it adds up to such a wonderfully pleasant experience that, while not terribly engrossing or groundbreaking is just tons of innocent, lighthearted fun. I truly hope that Voodoo Vince is successful. The developers have said that if it does well, they will do their best to make a sequel, and I would love for big budget platformers to become a thing again. Even though this particular game is a remaster of a much older game, I hope that it's a sign of things to come. Vince is more than welcome in the current gaming landscape. 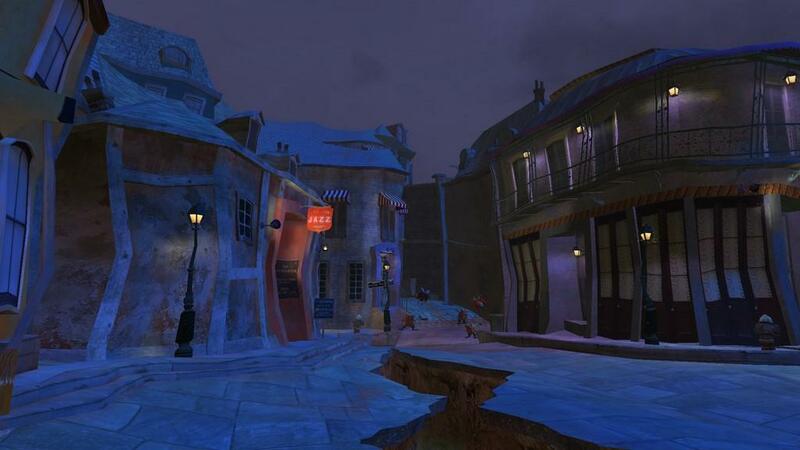 While not terribly original, Voodoo Vince is so irreverent and fun to play that it's worth looking into for anybody with an Xbox One.